have multiple voices, or at least one different voice reading the poems (otherwise I get the impression the poems don't stand out enough and it all sounds a bit samey). have more music maybe, to form transitions for the different sections/modules of the review? have sci-fi sound effects and fart noises. oh. and canned laughs, a laughtrack, of course. mix in voices from other sources, other recordings maybe. Jones had recorded some of his poetry, would have liked to mix that in. tl;dr: If at times endearingly antiquated in its sentiments, Beauty/Beauty is also doggedly the work of a millennial. Perry’s insistence on facing down and subverting familiar poetic subjects suggests a sensibility unlikely to rest on its laurels. 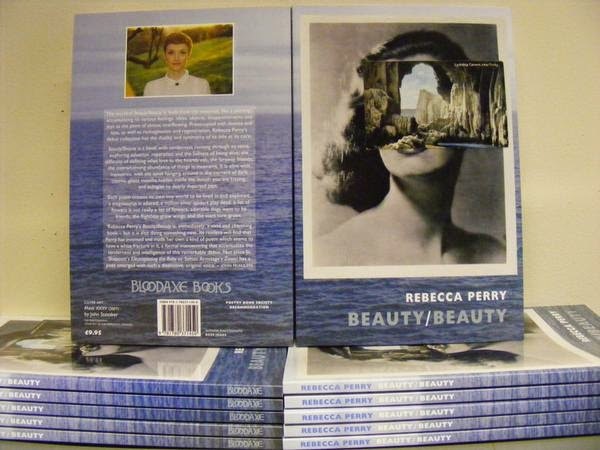 Like the artist John Stezaker, whose ‘Mask XXXV’ features on Beauty/Beauty ’s cover, Rebecca Perry’s first collection is in close proximity to Surrealism. Akin to Stezaker’s “preoccupation with … the revelatory potential of the obsolete object and image” Perry’s sensibility seems consciously Victorian in its choice of subject matter. ‘A Little Dog Angel,’ ‘Love Apart,’ and ‘Forever Friends’ are not titles that occur in this book. Yet that species of sincerity—the kind of poetry enshrined on the servers of familyfriendpoems.com, most written, most read, and for the most part completely ignored by ‘proper’ poets—is the kind Perry can’t resist playing chicken with. That Elizabeth Bishop was dismissed as cute, her choice of subject matter, and her miniaturist technique thought of as unworthy of the generation that spawned a gerrymandering giant like Lowell, seems pertinent to recall. Poems like the tongue-in-cheek ‘The Pet Cemetery’ succeed in-so-far as they are brave enough to face down and subvert the familiar. Rather than mawkish, ‘The Pet Cemetery,’ in approaching the long list of Perry’s deceased fauna (she should have opted for the Siberian hamsters) with the same collage technique used elsewhere in the book, manages to short-circuit conventional assumptions of the poetic. Ponto. See you on the other side. The major criticism I can see being levelled at such plucky endeavours is that they can be seen as slight. Certainly, when the tour de force ‘Dear Stegosaurus’—Perry calls it “a love letter”—ends with the line “your mouth holds more wonder than a sky full of stars,” (even if the preceding line is exceedingly beautiful) you wonder if it hasn’t simply been an exercise in frivolity. That Elizabeth Bishop was dismissed as cute, her choice of subject matter, and her miniaturist technique thought of as unworthy of the generation that spawned a gerrymandering giant like Lowell, seems pertinent to recall. That Bishop herself fretted she had “wasted half [her] talent through timidity” and feared that her poems were “precious,” is hopefully not something Perry has to worry about. The poems that play with space on the page (surely a fulfilment of the Glynn Maxwell prophecy) possess an assurance rarely found in the British tradition. (The spaced out among American poets, in the mainstream at least, include Gillian Conoley, Juan Delgado, and Helen Vitoria.) ‘On serendipity,’ ‘Over/wintering,’ and especially ‘Ergonomics’ hold the same quotidian-become-beautiful charm as Cummings and are equally difficult to resist. In what is perhaps an unintentional tribute to Stezaker “the dark spaces of subjectivity [in these poems] seem somehow blasted through, exposed and emptied out.” The artist’s reflection on his use of sea cave postcards seems remarkably relevant. Perry’s sensibility seems consciously Victorian in its choice of subject matter. Though I admit to being wary of the make-weight guff that comes out of workshops, the Williams mash-up contains beautiful lines, as does its Carson inspired relation. So, Rebecca — is everything ready? Are you excited? Everything is ready! For a while I just had a couple of boxes of books in my front room and I felt a little detached from the whole thing, then – are you ready for a terrible, half-baked simile – it was like that moment in Sonic where he smashes open the capsule to free the woodland creatures, and there’s a very brief screen-freeze, then the capsule blows up and they all leap out and gambol around. It was like that. The screen freeze was basically me walking past the boxes in my front room for a couple of weeks, looking at them a little distrustingly, then people started tweeting pictures of it and someone told me they saw it in a bookshop, and suddenly it felt like it was out there. Could you say a little about how you came to be publishing with Bloodaxe? I was incredibly lucky. For years I’d hoped that when I was ready for a book it would be with Bloodaxe – I’ve always admired the list and, more specifically, their legacy of publishing women and writers of colour where other poetry publishers were (and still are) failing to – so I sent my manuscript to Neil and, after suggesting I work on it a little and add some more poems, he accepted it. I’m very aware that I had a really easy run at the whole thing! Before talking about what's inside the book, it seems like the design — judging from the beautiful cover at least — is really important to you. Could you say a little about the process, about how much input you had in the design of the book? The cover was very important to me, actually, and I was very grateful that I was allowed to have a say in it. I think someone else choosing it would have been tricky for me. I’ve thought a bit about why it was so important and I think it comes down to two things: the first is that art is very important to me, something I have a great love for, so I figured the cover may as well be a work of art. Also, because the collection doesn’t have a unifying theme, sense of place, or central image as such, I wanted an image that would sit beside it abstractly, something a little stranger. The cover of Beauty/Beauty featuring 'Mask XXXV' by John Stezaker. Lots of specific things – dogs, fruit, hearts, ice, flowers – recur throughout the book, so I spent an inordinate amount of time googling bizarre images featuring those things and then, as the search became less hopeful and more crazed, dogs eating fruit, which inevitably descended into me just watching videos of dogs on YouTube. Then (mercifully) my friend Alex, who had been helping me search, suggested I look at John Stezaker’s work. I saw Mask XXXV and immediately knew that was the cover for the book. Luckily Neil agreed it would be perfect, Bloodaxe approached John for permission, and a few months later were granted it. Once I’d seen that image (though we’d yet to be granted permission for use) it presented itself in various ways in the few poems I had left to write, so it was like an unexpected one-sided collaboration for me. Now, in terms of the contents of the book, ROY made some predictions about poems that might have made it and there's a taster on the Bloodaxe website, but what can you tell us more about the poems in the new book? Where do they come from? In the end very few poems from the pamphlet made it into the book and it felt a sort of relief to leave them behind. Not necessarily because of any great feelings of shame about the older poems but just because I wanted the book to be a new thing. Most of the poems didn’t make it because there was no way I’d have written them now, however many years on and that felt akin to being dishonest, somehow. I find talking about my writing/articulating where it comes from very difficult. I suppose when I first started out writing I was certainly mostly reading male writers (Lorca, O’Hara and E E Cummings, who I still love) and lyric poetry, but for the last few years my interest has shifted and I’m interested in very different writing, mostly by women. So my poems come from the experience of being female, certainly, and the experience of love, and the terror of one day ceasing to be alive. 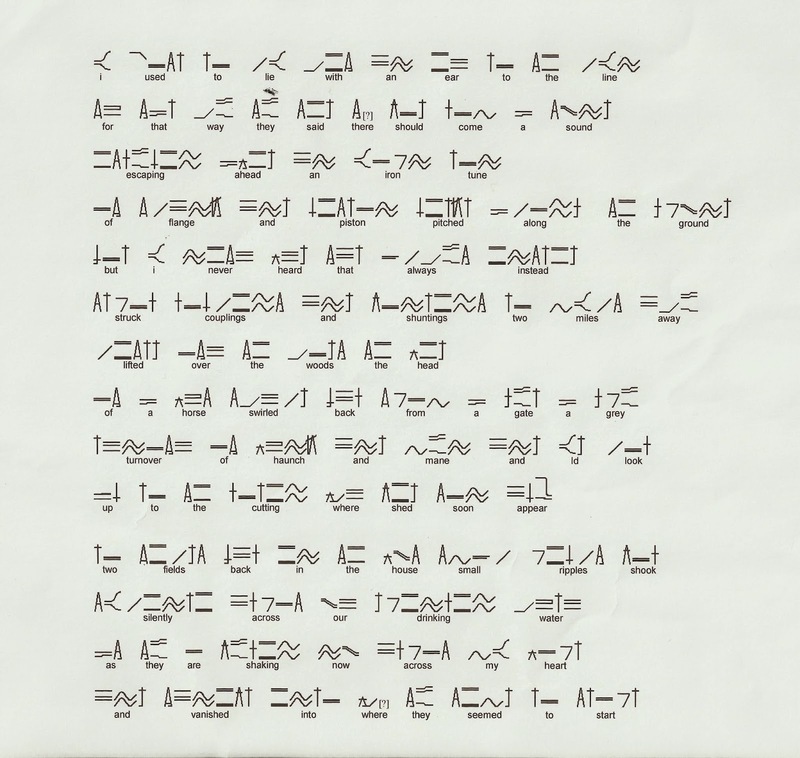 A friend who helped edit the manuscript had written and circled the note ‘DEATH’ on quite a lot of pages, which is… notable. What was the writing phase like from pamphlet to collection? They were very separate things – it wasn’t a case of the book developing from the pamphlet as such – and the book felt much more of a process. When I was working on the earlier poems with the vague notion that they might become a book, I was having my writing workshopped regularly and spending a lot of time worrying about editing them, being sure they were ‘clear’, hoping people didn’t hate them. Once the book was taking shape and I needed another 10 or 15 poems to make up the numbers, I wrote in a much more solitary, and less inhibited, way. I showed the poems to almost no one and a handful of them had only been read by one other person by the time the book published. I much preferred that way of working. What did you enjoy the most about preparing your manuscript? Once I’d made the decision to divide the book into sections it appealed more to my proclivity for micro-focusing. It was a much less daunting process to approach each section as a mini book within a book. Prior to that it had felt a bit unwieldy and overwhelming. I was also finishing the writing during summer so I had lots of weekends sitting in my local park or on my balcony in the sun, with a pile of books and a jar of gherkins, which was lovely. I also had a couple of people who really helped me work on the manuscript, so there were brilliant evenings in the pub looking through the poems, deciding what to cut and what to keep. The process was really made by some of my friends actually, being relentlessly supportive and enthusiastic when I ceased to be. Could you pick a poem to whet appetites? the quality of the light where you are. or how the street pulls away from the rain. so hungover that our skin hurt to touch. to be heartbroken at the same time? in the time it took you to shower. the rain, which hit the house sideways. waiting to be filled with soup? And the other one said, of course. and stretching out its back bones. and it’s all laid out arrogantly between us. in the (custardy light of a) morning? Thanks from ROY and the little lizard to Rebecca Perry for responding to the suggestion of an interview at such a busy period. If you'd like t'see your work, or can think of someone else's, you'd like to see up on ROY then y'know what t'do. Forthcoming Reviews - click for details. Rory Waterman: “Eee, the bluurk really calls a spade a spade."